Milkweeds in the lower desert are easy to grow and do not require cold-stratification for germination. Desert or Rush Milkweed (A. subulata), Pineleaf Milkweed (A. linaria) and Arizona Milkweed (A. angustifolia) are evergreens in the lower elevations and thrive in warm temperatures. In particular A. subulata grows best when planted when temperatures are high and can even be started during our summer monsoon season while A. linaria and A. angustifolia are best grown in early spring or fall. Seeds benefit from a deep soaking in warm tap water for 24 to 48 hours before planting to simulate abundant rains in the desert to soften their seed coat. We now have a short video about starting low desert milkweeds from seeds. Questions? Email us info@swmonarchs.org. Unlike lower desert seeds (A. subulata, A. linaria, and A. angustifolia) that can be planted without any pretreatment, those that grow at higher elevation (A. speciosa, A. latifolia, A. tuberosa, A. asperula, A. subverticillata, etc.) need cold stratification for germination. In nature milkweeds set seeds in the fall and disperse. When seeds land on bare soil and are subject to winter snow, rain and cold temperatures they may emerge and grow the following spring. In the southwest moisture is sporadic and milkweed seeds germinate in response to moist conditions that soften the seed coat and support new growth. Plant seeds in ground in the fall Collect local milkweed seeds for best adapted success. Plant the seeds in October and November by lightly scratching the surface soil and distributing seeds. Gently cover the seeds with a scant ¼” of soil and press the soil lightly to compact the surface. Be sure to use ample seed to cover seasonal loss to rodents and other field conditions. Winter precipitation and temperatures should help prepare seeds for spring germination. Results vary by seasonal moisture, rodents, other field predators and seed condition. Cold stratification You can also simulate winter weather conditions to prepare milkweed seeds. Soak a paper towel with water; gently squeeze the water out and lay the damp paper towel on a flat surface. In a single layer lay out milkweed seeds on the paper towel. Gently fold the moist paper towel with the seeds and place it a plastic zip-loc bag. Label the bag with the name of the milkweed and date. Place the bag in your refrigerator for at least 30 days. Check the bag frequently for mold and move the seeds to a fresh, moist paper towel when needed. After 30 days leave the plastic bag on your kitchen counter for several days. On the second day begin to check the seeds for signs of the root beginning to emerge from the seed. When you see the root appear, plant immediately in a soil medium and keep moist until the seedling fully emerges. Keeping seedlings on a heat-mat under grow-lights can help expedite this process. Remember the heat-mat dries the soil quickly so water frequently. 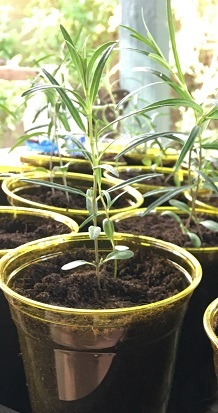 Speed Seed Start for Middle and High Elevation Milkweeds Over the last three years several people have reported success with soaking some middle and high elevation milkweed seeds only and skipping the 30 day cold stratification process. David of Flagstaff and Cathy and Bob of Prescott and others have reported success with this method. Our trials have produced 92% to 97% germination. A recently published paper by Kaye, Sandlin and Bahm shows similar results. This Speed Seed Start may not work for all milkweeds but is known to be successful for these species: A. subverticillata, A. asperula, A. tuberosa, A. latifolia, and A. speciosa. Method: Add milkweed seeds to a glass jar and fill the jar with the hottest tap water. Let the water cool to room temperature and soak for 24 hours. Drain the water and refill the jar with the hottest tap water and let it cool a second time for 24 hours. (For some species, repeat the process according to list below.) Repeat daily until a small root begins to appear. Now your seeds are ready for planting. Note: not all seeds are fertile. Selecting those with roots will increase your success rate. Drain the water and plant the seeds in a growing medium. Keep newly planted seeds moist. Approximate soaking time required for various species. Speed Seed Start should work for middle and high elevation milkweeds in Arizona and New Mexico. It has not been tested in the high elevations of Nevada, Utah, or western Colorado.